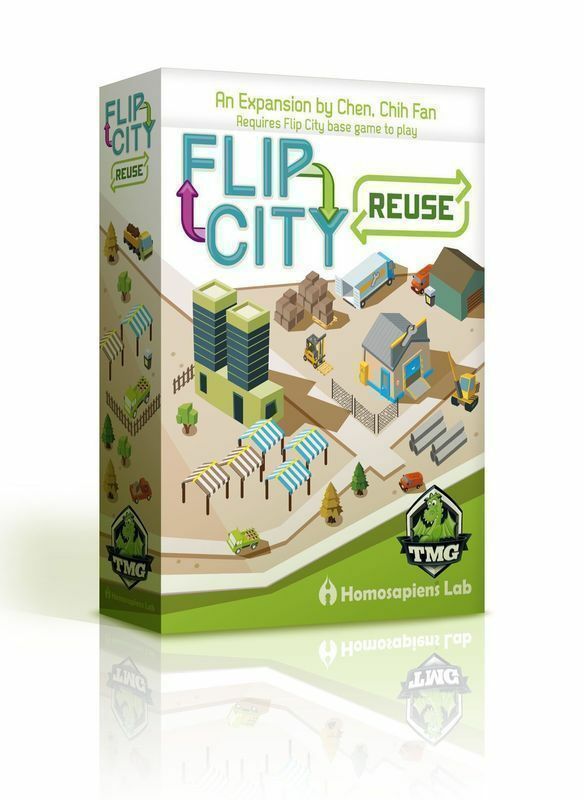 The first expansion to the card game Flip City, Reuse adds 2 more card stacks to buy from for a total of 4 new buildings: Plumber Shop - Flipped side: Renewal Agency Flea Market - Flipped side: Recycling Bin The Plumber Shop allows you to force each opponent to discard the top card (which is public knowledge) or the bottom card (which you do not get to look at beforehand) of their deck. You chose top or bottom and the effect is applied to all opponents. The Renewal Agency provides 3 cash which can only be spent towards the flip cost portion of Flip and Develop actions. The Flea Market can be voluntarily left in your discard pile when shuffling. Furthermore, it has the 'recycle' symbol on the starting side which means it can be recycled (turned over while in your discard pile) to provide 1 additional cash. Remember that you can only recycle during the 'Play Cards' phase. The Recycling Bin has no effect when played. However, when you pay its flip cost to turn it back into a Flea Market, you may flip an additional card that turn.